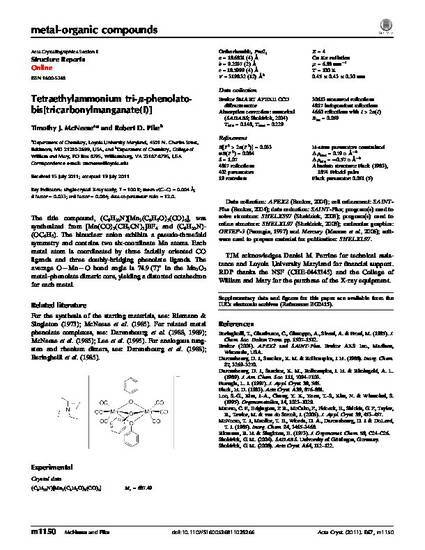 The title compound, (C8H20N)[Mn-2(C6H5O)(3)(CO)(6)], was synthesized from [Mn(CO)(3)(CH3CN)(3)]BF4 and (C8H20N)-(OC6H5). The binuclear anion exhibits a pseudo-threefold symmetry and contains two six-coordinate Mn atoms. Each metal atom is coordinated by three facially oriented CO ligands and three doubly-bridging phenolate ligands. The average O-Mn-O bond angle is 74.9 (7)degrees in the Mn2O3 metal-phenolate dimeric core, yielding a distorted octahedron for each metal.